Sotterley is home to the secretive church of St Margaret, set in the grounds of Sotterley Hall. St Margaret is one of the most interesting and lovely small churches in East Anglia, but you'll need to walk for a mile across fields to reach it. This was probably sufficient to put off Simon Jenkins, who unaccountably missed it out of his England's Thousand Best Churches. In the 19th Century, Sotterley Hall was home to the Barne family. In 1883, they paid for the construction of this small mortuary chapel and burial ground down by the crossroads in the village. Whether it was intended to save the poor villagers of Sotterley the trouble of taking their dead to the Hall to be buried, or to save the Barne family the inconvenience of those same villagers tramping up their drive with coffins, is open to question. Perhaps the churchyard was full. Whatever, the new burial ground was certainly a convenience. 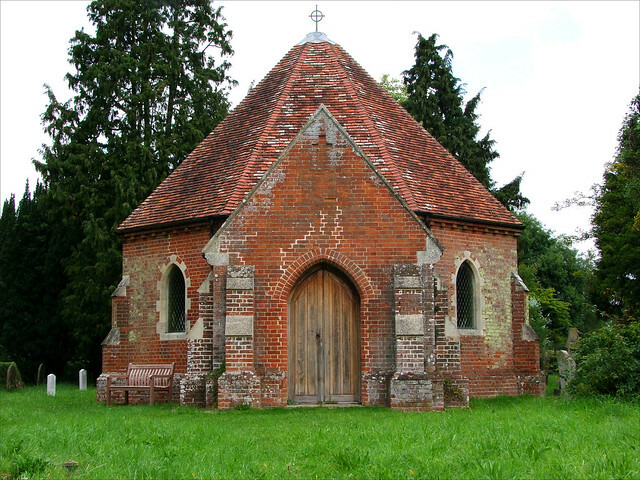 The modern connotations of the word 'mortuary' are rather off-putting, but it simply means a building where funeral services could be read before burial, but which was otherwise not used for the ceremonials and liturgy of the church. The building is octagonal in shape, with a porch at each end. It is actually the doorway at the opposite end to the gates which is the entrance. Inside, benches provide seating for concerts and other events, but there is also the funeral bier to remind you of the main use of this building in days gone by. Ten years ago, this building was in poor condition, and found itself on the local authority's Buildings at Risk register. It was even threatened with demolition. Fortunately, an enthusiastic band of locals got together and formed the Sotterley Chapel Preservation Trust, which took the building to task. They've repaired or replaced pretty much everything except the walls: the floor had to be completely replaced, and the roof also underwent considerable refurbishment. The crumbling buttresses have been replaced sympathetically. It lifts the heart to step inside this building now, despite its former use. And Sotterley burial ground is still open for burials today. It is an interesting place to wander, and there are a couple of particularly lovely modern memorials, including one to the artist Jenny Creasy, who lived locally.